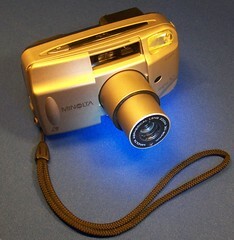 The Minolta Vectis 30 is a compact zoom camera of Minolta's Vectis series for the advanced photo system (APS). It was manufactured in Malaysia. 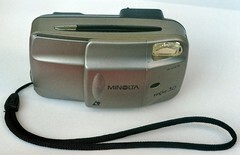 Its body is sized like that of an average 35mm compact camera. That means it's a quite big APS compact. 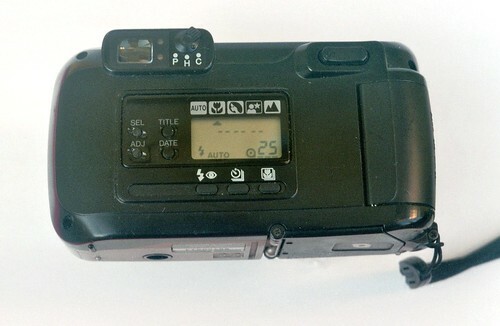 Beside a fully automatic mode it offers four exposure programs: near object, portrait, night scene and landscape. It can store date and title for each exposure, on the magnetic surface coating of the APS film. Different flash modes can be chosen, as well as a self-timer mode for the next exposure. All these settings can be controlled by means of a small LCD display on the back and seven little push-buttons. The camera has to be switched on by shifting its front door aside. The film chamber opens electrically when the film is wound back and the opening button is pressed.